Mark Zahra has been confirmed to take the ride on Harlow Gold, when the talented filly takes her position in Saturday’s 2017 Australian Oaks field at Royal Randwick. The pair will jump from barrier 12 of 14 however the big striding daughter of Tavistock appreciates a bit of galloping room and Mark will have ample time to find a position in running for the 2400m Classic for 3yo fillies. Harlow Gold has been partnered by Regan Bayliss in each of her ten career starts to date, but the in-form hoop will miss the 2017 Australian Oaks after receiving a suspension following the filly’s run for third in the Group 1 Vinery Stud Stakes (2000m) a fortnight ago. While disappointed that the young jockey will not be available to ride Harlow Gold in what is her major campaign target, co-trainer Tom Dabernig is confident that the filly is in peak condition for the Australian Oaks. “I think she’s right on track,” Dabernig said. “She handled the wet the other day and we know she runs the trip so you’ve got to think she’s got a chance. “We tried to set her for the Oaks. She was terrific in the VRC Oaks, it was just that tearaway leader (Lasqueti Spirit) who she couldn’t peg back. “I’d say, without seeing the final field, she would have to be one of the top three or four chances. Harlow Gold immediately stamped herself as a filly to follow upon debuting in 2016 and posted consecutive wins in the John Duff & Co Maiden Plate (1400m) and National Jockey Trust Plate (1600m) upon resuming in spring. Making a competitive transition to black type company when fifth in the Group 1 Thousand Guineas (1600m) on October 8th, the Tavistock filly placed a credible sixth in the Group 2 Moonee Valley Vase (2040m) before ending her year second in the VRC Oaks. 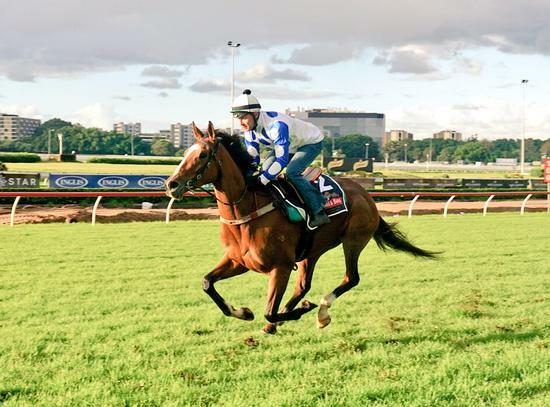 Resuming this year for third in the Group 3 The Vanity (1400m) on February 18th, Harlow Gold ran on for a close third in the talent-rich and capacity Group 1 Australian Guineas (1600m), in what was her only other start prior to the Vinery Stud Stakes. Harlow Gold is currently considered a $5 chance in early 2017 Australian Oaks betting market.